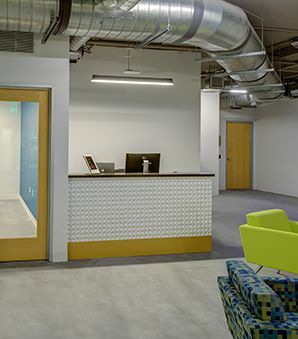 This office space expansion and remodel took place in the Zynga building, located in San Francisco’s booming SoMa Area. Our Client, Nuna Health, contracted Conscious Construction to build out professional and recreational aspects of their newly leased 30,500 SF office space. The project included relocating a new main entrance and reception area with a custom reception desk, highlighted with a contemporary LED lighting system and surrounded with modular tiles. We also created a new, custom commercial kitchen to meet the needs of our client’s sizable and growing work force, featuring new custom built cabinets, polished concrete floors, and Pental Quartz counter tops. 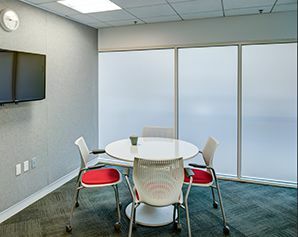 Privacy was a priority for our clients, especially for the build-out of two new conference rooms and the remodeling of eighteen conference/idea rooms and one gym. Proper measures were taken to control acoustics and create spaces that promote creativity and spontaneity. The walls of the conference rooms were lined with dry erase paint and accent walls. Windows of certain rooms that required heightened privacy were treated with a frosted film.